For $5 per month, Sling TV subscribers get 50 hours of DVR storage in the cloud. Sling TV is adding more devices to its 'First Look' for the new Cloud DVR feature. Sling TV subscribers with an Apple TV can now try the beta service for $5 per month, which gets you 50 hours of Cloud DVR storage. Cloud DVR first showed up as an invite-only beta last December on Roku devices and select Smart TVs. At the time our general impression was that it was a nice feature, but still a work in progress. Several months later, in March, Sling TV began selling the 'First Look' version of Cloud DVR to Amazon device owners. Then earlier in April, the 'First Look' rolled out to Roku and regular Android devices. Now, it's Apple TV's turn. For an extra $5 monthly on top of a Sling TV subscription, the 'First Look' Cloud DVR lets you watch recorded broadcasts on all currently supported devices. The feature includes what Sling calls "conflict-free recording," which means you can record multiple programs at the same time. There's no specific limit on how many programs you can record at one time. Sling TV also lets you keep your Cloud DVR recordings as long as you want, similar to many set-top DVRs. 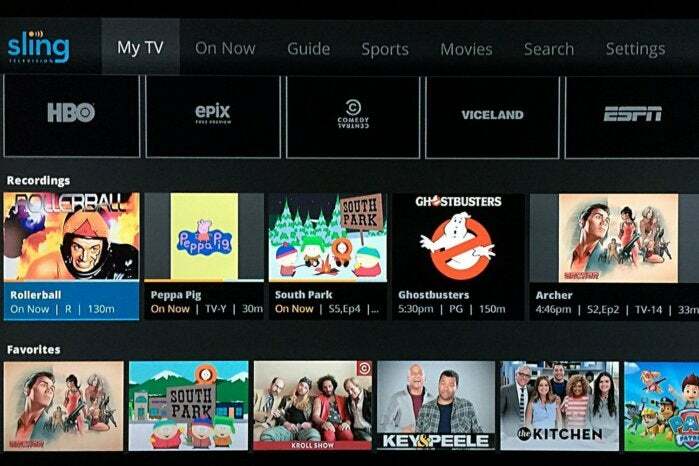 Other services, such as PlayStation Vue, let you keep recorded programs only for a limited time. However, by default Sling TV will automatically delete older recordings to make room for new ones once you get close to the 50-hour limit. The impact on you at home: Cloud DVR is a great addition for Sling TV subscribers, but one glaring problem still remains with the service. Namely, certain channels do not work with Cloud DVR. In December, that list included FX, FS1, FS2, FXX, National Geographic, ESPN, ESPN2, ESPN3, Freeform, Disney Channel, Disney Junior, and Disney XD. That means no ESPN or FS1 sporting events can be recorded, and popular TV shows like The Americans, Fargo, and Star Wars: Rebels are also out. We're checking with Sling TV to see if the list of restricted channels has changed at all. Regardless, any channel restrictions on DVR recordings are the biggest drawback to using the new feature.